The number pi is very cool. Many people say that pi is cool because of all the unexpected places it appears. In fact, they don’t just say it’s cool, they even go so far as to say that there is some sort of mystical significance in the fact that it appears all over the place. Which is of course bunk. If you investigate closely each of the places pi appears unexpectedly, you’ll find that there is a circle there somewhere, so it’s hardly surprising that pi turned up really. Case in point is Buffon’s needle experiment, where a needle is thrown at a set of parallel lines that are the same distance apart as the needle is long. The probability of the needle hitting the line is 2/pi. But it’s hardly surprising that pi is there because whether the needle hits a line is based on the rotation of the needle — see the circle? If I were going to go all mystical about pi, I woudn’t choose the fact that it appears unexpectedly. No, I would choose the fact that often it doesn’t appear when by rights it should. Here are two awesome examples that have come up in the Maths Learning Centre with higher level students in the last few months. EXAMPLE 1: The intersection of two cylinders. Suppose you get two cylinders of radius 1 and you push them through each other at right angles. In the centre there, you get a part that is completely enclosed by the curved walls of both cylinders. What is the volume of this shape? Finding the volume of this shape is a nice exercise in problem-solving where you utilise the symmetry of the situation to break the problem into smaller parts. It also illustrates some nice things about how to set up double integrals. But that’s beside the point. The point is that when you find the volume of this shape you get 16/3. Yes that’s right: The volume of the intersection is 16/3. Where did the pi go? EXAMPLE 2: The length of a cycloid. 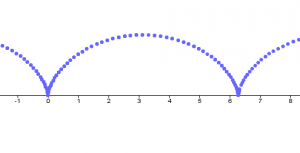 A cycloid is the curve produced when you roll a circle along a line and follow the path of a single point on the circle’s edge. You can see the shape made if you look at the picture. 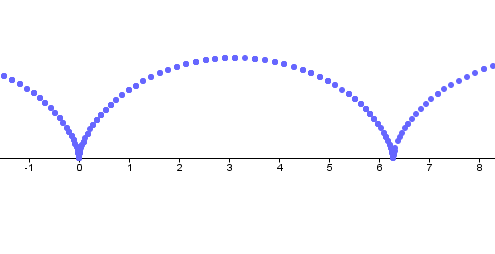 The question is: how long is one loop of this curve (supposing that the radius of the circle is 1)? In order to find this length, you have to parameterise the curve and then do a path integral, and it’s not very easy to do. But when you do the answer you get is 8. Yes that’s right: The length of one loop of cycloid is 8 — a whole number. Where did the pi go? Pi should be in these places, but it is not. It’s almost as if the pi-ness of the two cyclinders cancelled each other out, or that the cicle undid its pi-ness by rolling along its circumfrence. If you want something about pi that’s mystifying then this is it in my book! Just out of interest, where is the circle in the Leibniz formula?